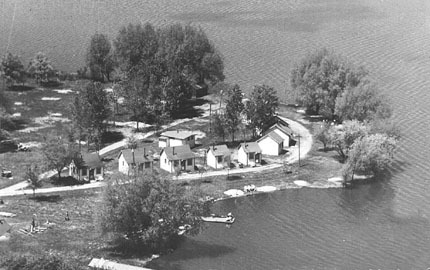 An aerial view of Birdseye Centre and the cabins which were located at the north end of Water St., along the shore of Lake Scugog, Port Perry. 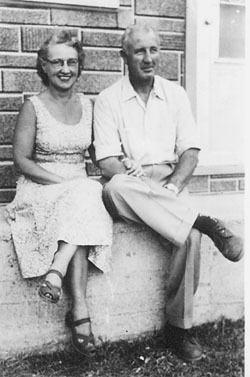 Eddie and Hilda Michell, (below) moved to Port Perry during 1939 and shortly after arriving purchased a rough piece of property at the north end of Water St. The Michells spent much time clearing and levelling the land, with plans to build a tourist park on the land overlooking Lake Scugog. Work began on a 30'x80' swimming pool on the property in August 1939. The following summer the pool was opened and construction began on the first of nine efficiency cabins along the lakeshore. In May 1940, following negotiation with the Toronto Star, Mr. Michell received exclusive permission to call the park, Birdseye Centre Cabin Park, after the popular cartoon series. 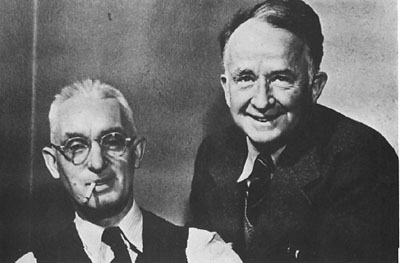 The cartoon series was created by former local resident Jimmy Frise, along with his friend Greg Clarke, and was featured weekly in the Toronto Star. 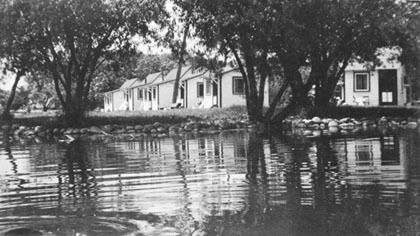 Over the next 30 years, the park became a popular spot for tourists, many making long treks to stay in the beautiful park with picturesque cabins overlooking Lake Scugog. After operating Birdseye Centre Cabin Parks for more three decades, the park was sold to Scugog Township 1969. A few years later the cabins were removed and the land was returned to its present condition. Although it's undergone some restoration work over the years, the outdoor pool built by the Michells in Birdseye Park during the fall of 1939 was in used until 2001, when it was removed and replaced by a new pool. 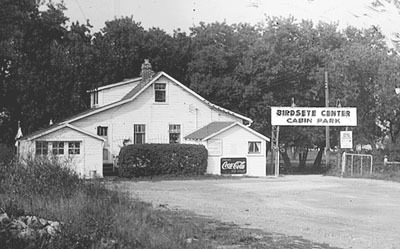 The entrance to Birdseye Centre Park, was at the north end of Water Street, beside the Michell's house and refreshment booth they operated at the park. View from the lake of some of the Birdseye Centre Park cabins as they looked nestled among the trees along the shoreline. 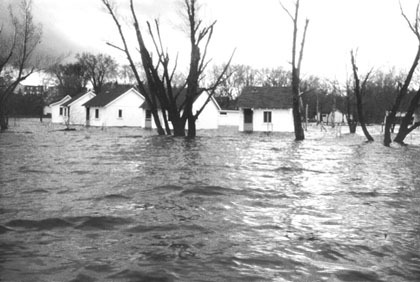 Birdseye cabins submerged during a sping flood in 1960. 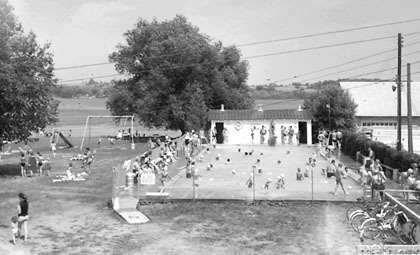 A view of Birdseye Park swimming pool during a hot summer day about 1955. 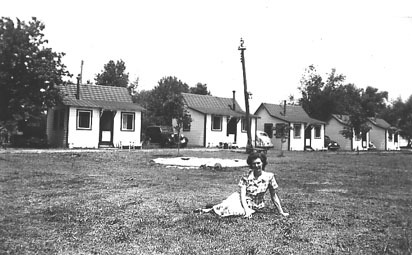 A guest sits on the grass outside the cabins in the park about 1940. In many ways, one of the most unlikely residents of Scugog to become famous was James Lewellyn Frise, a farmboy from Scugog Island. But this unassuming young man went on to become one of Canada's most famous characters during the early part of this century. 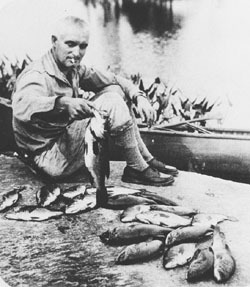 Jimmy Frise, as he was best known, became a household name with his "Birdseye Centre" cartoons in the Toronto Star Weekly during the 1920s and 30s. A feat he accomplished without one lesson of instruction in the world of art. Jimmy was born on a small farm on Scugog Island overlooking Lake Scugog and Port Perry in 1891, the only child of John and Hannah Frise. He grew up in the villages of Seagrave and attended school in Port Perry. His artistic talents became evident at an early age, as his schoolbooks were covered in sketches, many which were the early etching of "old Archie" and "Pigskin Pete", two characters from Birdseye Centre which became folklore across Canada. Jimmy Frise relaxing in his office at the Toronto Star. In 1910 at the age of 19 year, Jimmy headed off to Toronto to search for a job that would lead him to his love of art. It was almost a year later, after many disappointments that his first break came, when the Toronto Star published a cartoon he had submitted. He ran to the Star with his cartoon waving in his hand, only to find out the paper had been looking for him for 10 days, because he had not left instructions where he could be contacted. But as luck would have it, Jimmy was hired on the spot into the paper�s art department. In 1916, still undiscovered as an artist, he moved to Montreal to further his career at an engraving house. Shortly after arriving, he enlisted in the artillery and went to war. It was during his stint overseas during the battle of Vimy, that he was wounded in battle. 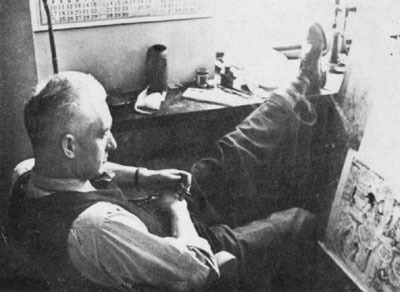 Returning to Toronto he once again began working at the Star, this time cartooning full time. In 1921 he created his first half-page cartoon for the Star Weekly called "Life's Little Comedies." Within months the cartoon's name was changed to "Birdseye Centre", and Jimmy's career was launched, a career which spanned more than 25 years. 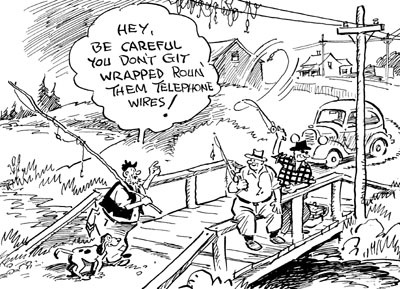 One of Frise's "Birdseye Centre" cartoons featured in the Star. He was often asked the the location of the town he was portraying in his cartoons, and he answered "any Canadian village with a hotel, gasoline station, barber shop and a town pump." This despite many people from the Scugog area who felt some of the characters and situations were taken from locations around Port Perry. When found at work in his studio, Frise was said to be seldom found alone. His office was gathering place for characters who stood around talking and watching from morning until late at night. It was said he rose to the top of his profession with no sense of urgency, a trait that drove his frantic editors mad. In fact, Gregory Clark wrote that Jim Frise was a "legendary artless artist." Even at the top of his career Jimmy never forgot his roots back along the shores of Lake Scugog. He returned often to spend time with old friends and family and spoke to local groups about his career as a cartoonist. He was a lover of the outdoors and spent a great deal of time fishing and hunting. He had an extraordinary love for dogs especially "Rusty" his water-fearing spaniel, who was featured many times in his cartoons. Jimmy fishing near his home on Lake Scugog. Jimmy Frise was married after the war to Ruth Elizabeth Gate and the couple raised four daughters, Jean, Ruth, Edythe and Betty, and one son John. His long-time friend and colleague Gregory Clark said Jimmy was a living cartoon and wrote the following after his death on Sunday, June 13, 1948. "He was an original, unbendable, bemused, rapt, lovable guy in love the the gentleness and decency of life amid all the storm and rage. Doing what comes naturally was all he ever did, and it gave a whole generation of thirty years smiles and laughter and never a soul hurt in all that time". Jimmy Frise and his good friend Gregory Clark. Jimmy Frise died at is home in Toronto on Sunday, June 13, 1948 at 57 years of age. Some original Frise cartoons and a historical plaque commemorating Jimmy Frise are on display at Scugog Shores Museum.